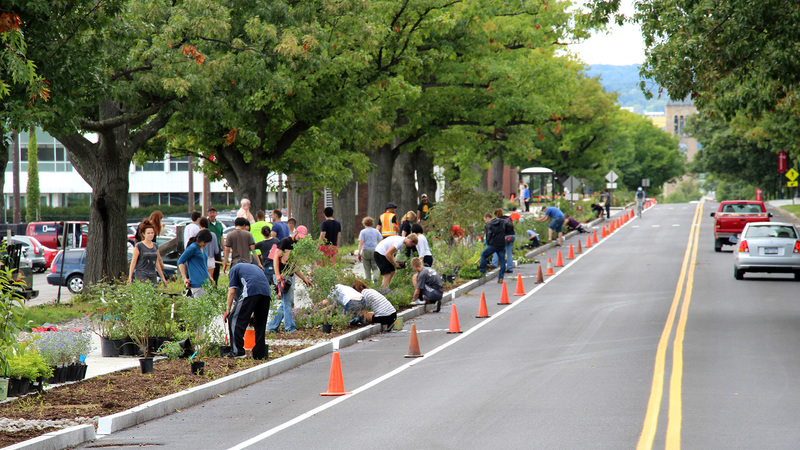 Thursday, students in Creating the Urban Eden: Woody Plant Selection, Design, and Landscape Establishment (HORT/LA 4910/4920) planted more than 1,000 feet of beds along Tower Road from Plant Science Building to Stocking Hall with nearly 1,000 woody shrubs. 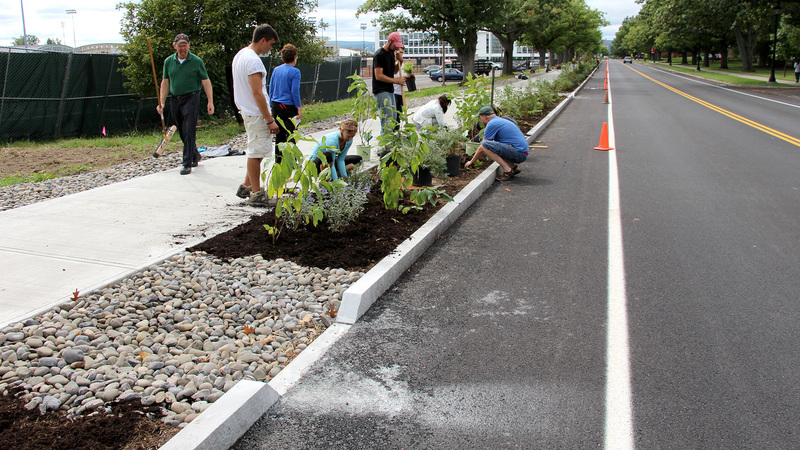 The bioswale is designed to channel water runoff from Tower Road into the beds so that the water can infiltrate and recharge groundwater instead of going directly into storm drains and discharged ultimately into Cayuga Lake. The shrubs were selected based on their ability to tolerate both saturated soil and intermittent dry conditions, as well as tolerance to road salt. That selection was guided by research conducted by former Graduate Field of Horticulture student Ethan Dropkin (MPS ’14). 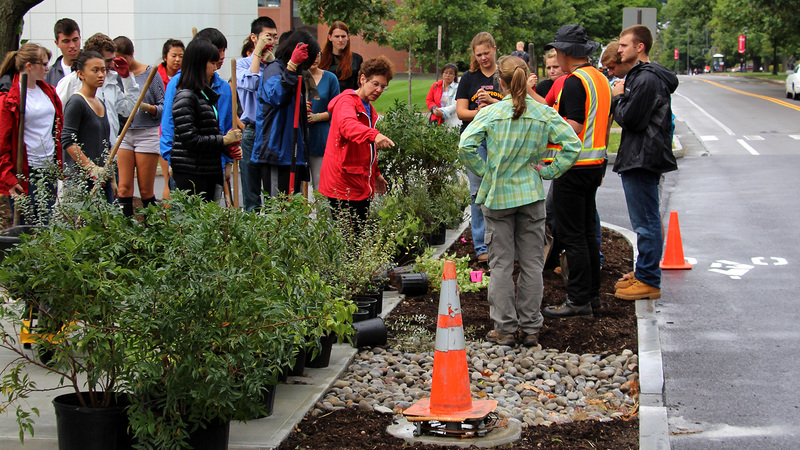 Dropkin’s publication, Woody Shrubs for Stormwater Retention Practices (Northeast and Mid-Atlantic Regions) is available online at the Urban Horticulture Institute website. Bassuk instructs students before planting. 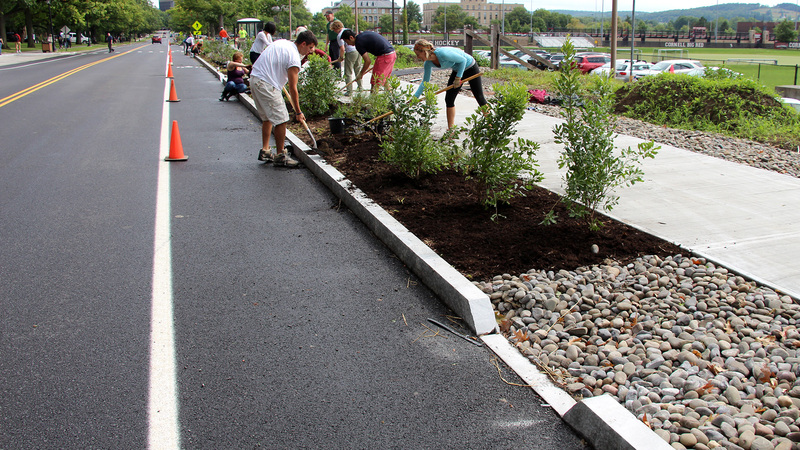 Curb cuts channel runoff into into bioswale. The shrubs used are tolerant to road salt and intermittent flooding and dry soil conditions.